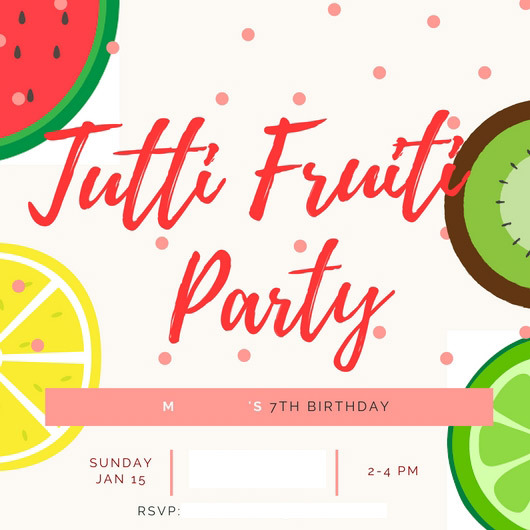 My youngest celebrated her seventh birthday recently and with Summer in full swing, she requested a tutti frutti. Both girls were excited to help organise and decorate the party, and we had plenty of bits and pieces that we could reuse from other events. 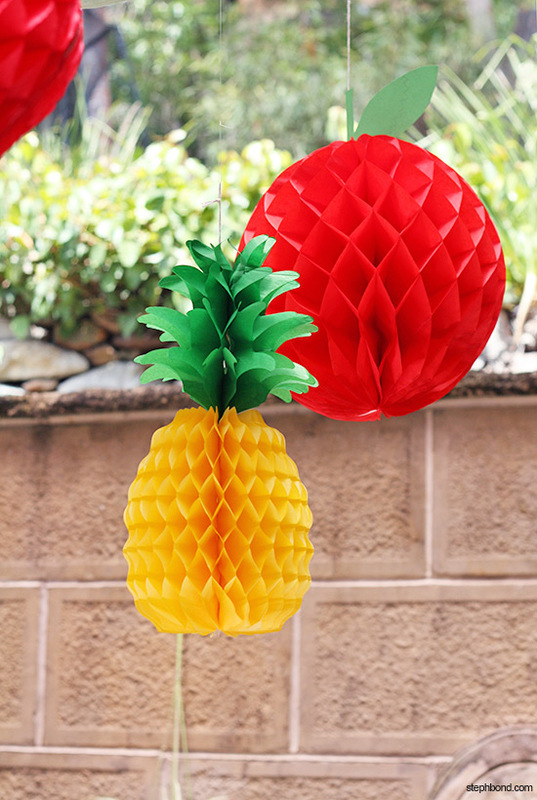 The key here was to have one large focal point to set the scene for the party - in our case it was the honeycomb fruit decorations. Then it was easy to just serve up as much fruit as the girls could eat! Invitation: Made using Canva and send by email. Cake: Special request from the birthday girl. 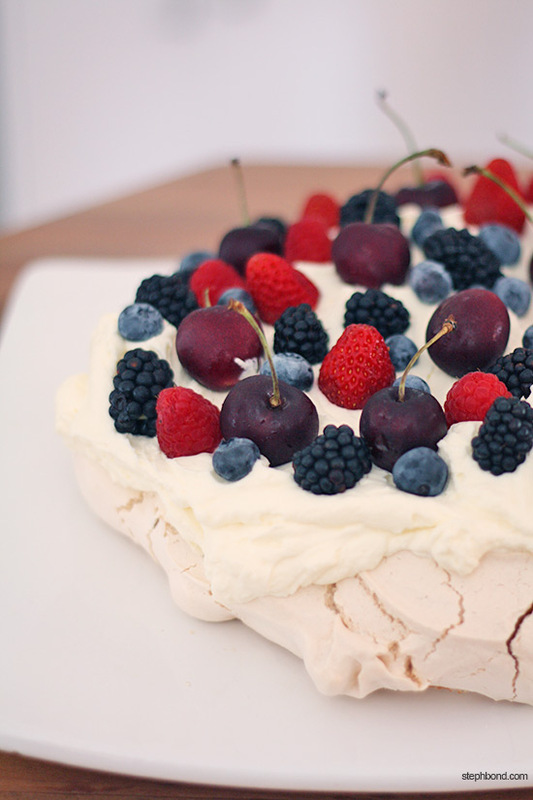 Homemade meringue topped with whipped cream and berries (strawberries, blackberries, blueberries) and cherries. 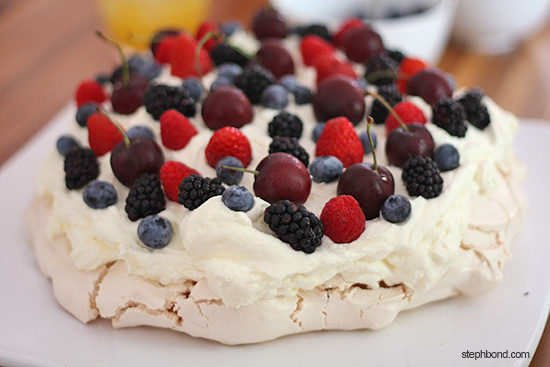 Party Food: As much fruit as the girls could eat! 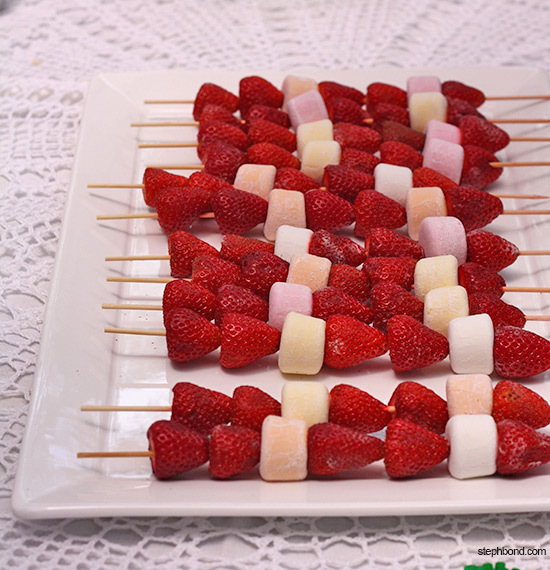 Strawberry and fruit-flavoured marshmallow skewers, tropical fruit jellies topped with whipped cream and raspberries, fruit punch, cups of berries and cherries, platters of watermelon, mango and peaches. We also served some plain chips and some fruit-flavoured jellybeans for those who weren't keen on the real thing. 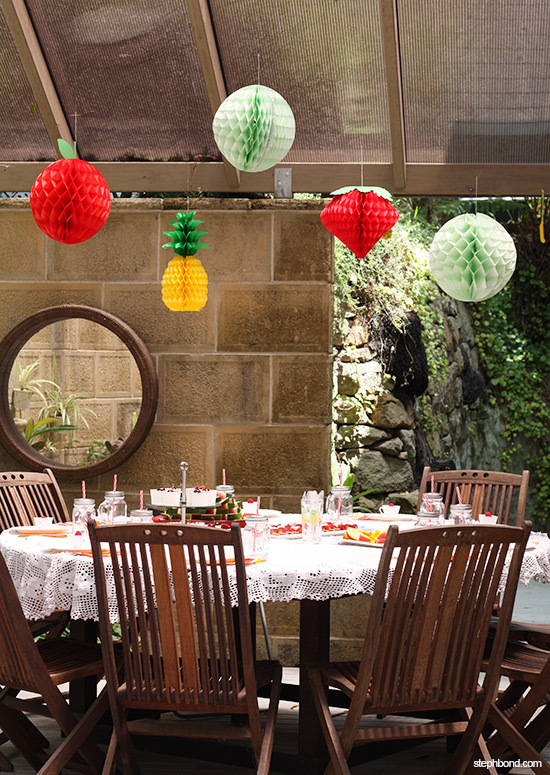 Decorations: The focal point for this party was the collection of honeycomb fruit decorations. 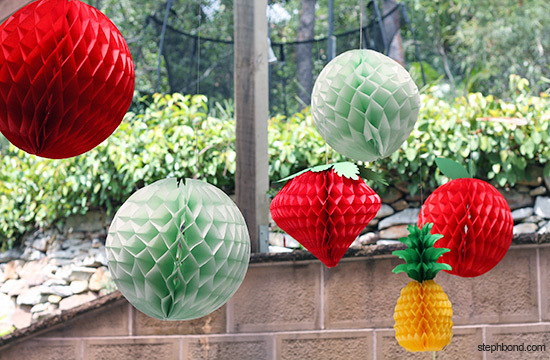 We already had the mint green and red balls and a red diamond from other events, and just purchased a pineapple honeycomb decoration to add to the mix. The green balls looked a bit like limes. 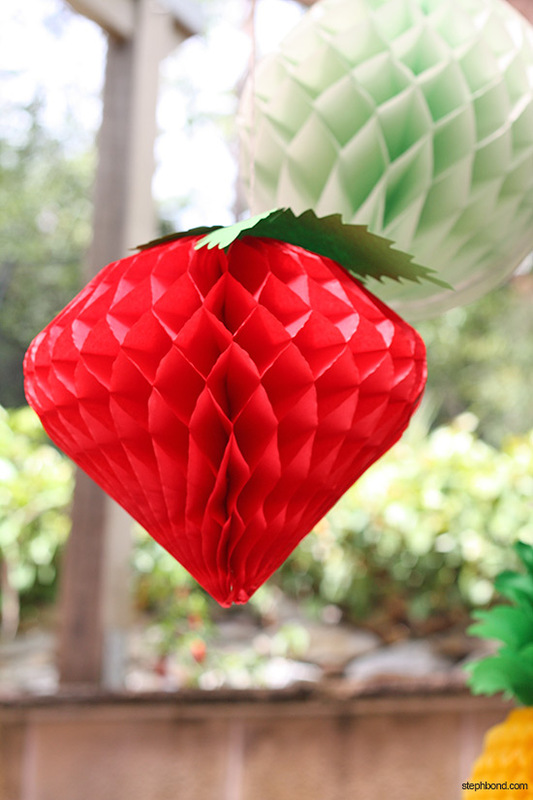 I cut stems and leaves from green paper and attached them to the two red balls to make apples. I cut the top off the red diamond, and rounded the edges to create a strawberry shape. I then cut out a strawberry leaf shape from green paper and attached new string. Cute! 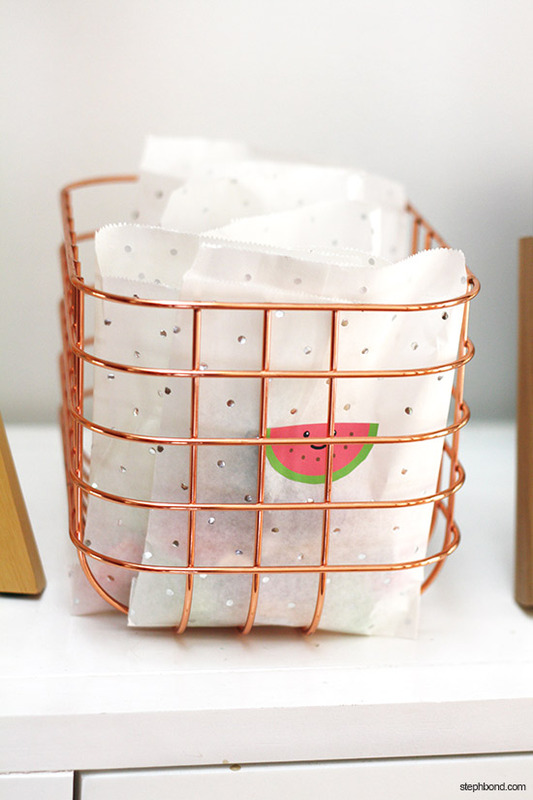 We set the table with a vintage white crocheted table cloth, leftover colourful IKEA napkins from another event, and glass mason jar cups with reusable straws purchased from Big W for a previous party. 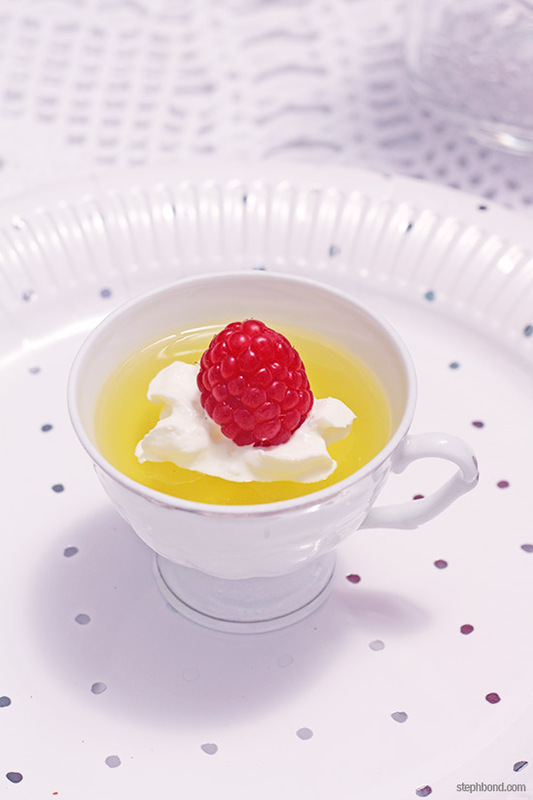 The jellies were served in mini tea cups from St Vinnies that I bought many years ago and use for every party. 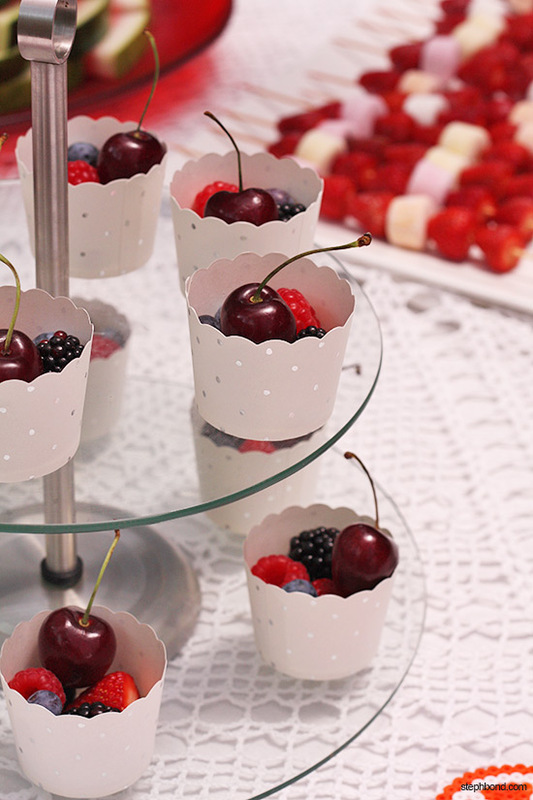 We only bought some matching paper plates, cupcake wrappers to use for the berry cups, and goodie bags in white with silver spots. 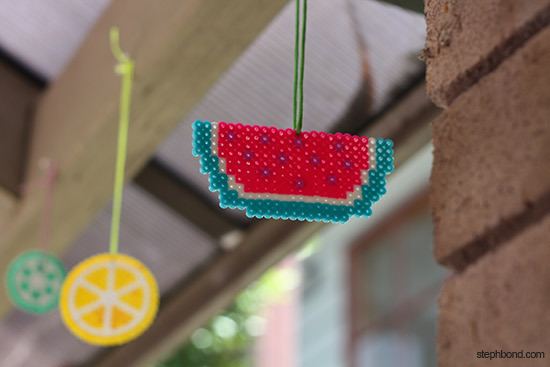 I had some watermelon bunting that I had made from my daughter's watermelon party a few years ago, so we hung that up again too. Games/activities: The girls were more interested in free play than organised activities, but we managed to get them to play a few games involving tossing and catching oranges. 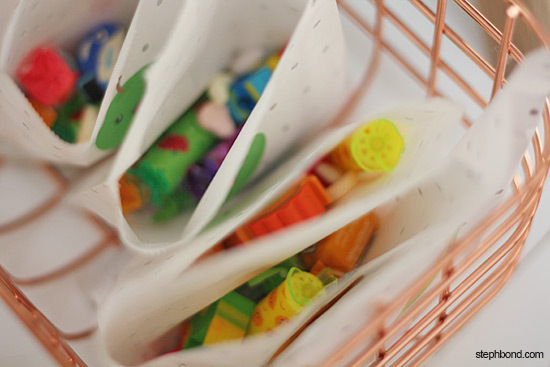 Party gift/favour: I'm not huge on goodie bags, but I found a cute pack of fruit highlighters from Smiggle and popped one in each bag with some fruit-flavoured Natural Confectionary Co. Lollies. The girls donated erasers to each goodie bag from their enormous stash too, and decorated each bag with a printed and cut-out smiling fruit face. Tip: You really don't have to go to too much fuss to pull together a cute party; just focus on one visual item that makes a statement, a cake, and you're practically done. You also don't have to have everything perfectly matching or themed; re-use as much as you can from other events. 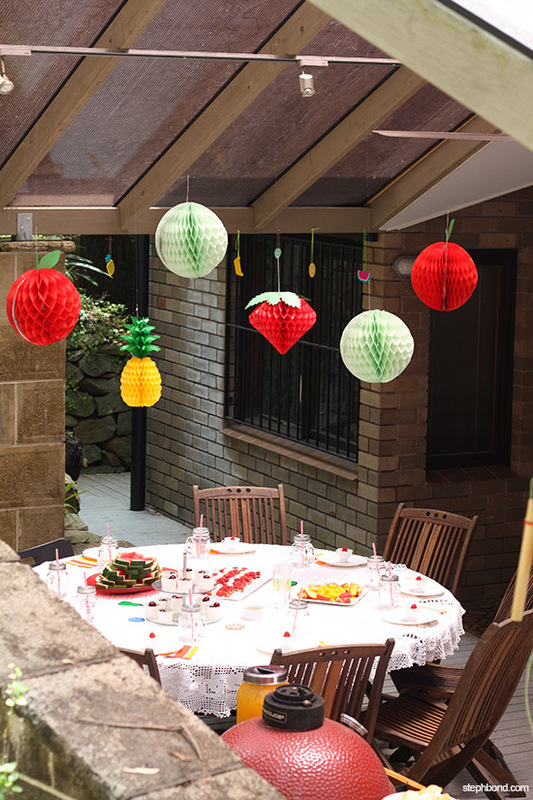 Something Special: The girls also spent a lot of time leading up to the party making fruit shapes from hama beads. 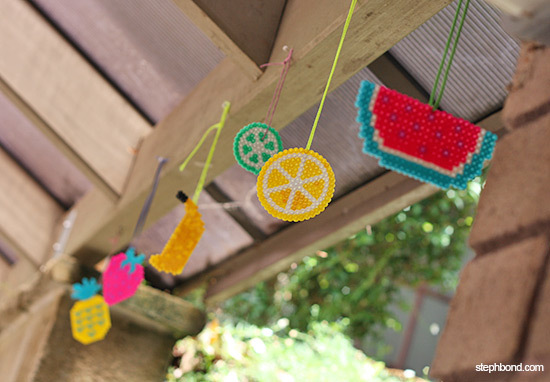 There used a few designs from a Smiggle pack that they already had (watermelon, pineapple and strawberry), and the rest of the fruit designs they made up themselves using more beads that we bought from IKEA. They hung them up with different coloured string themselves. 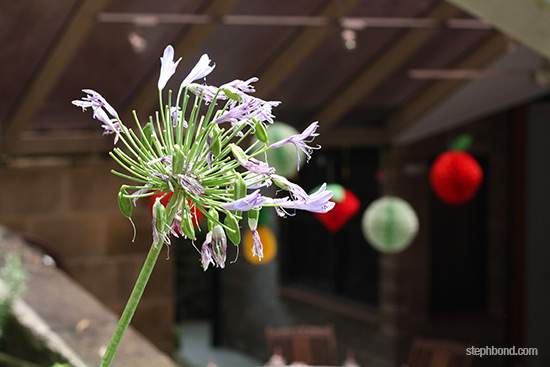 It was a great school holidays activity, and they could use their creativity and contribute to the party too. 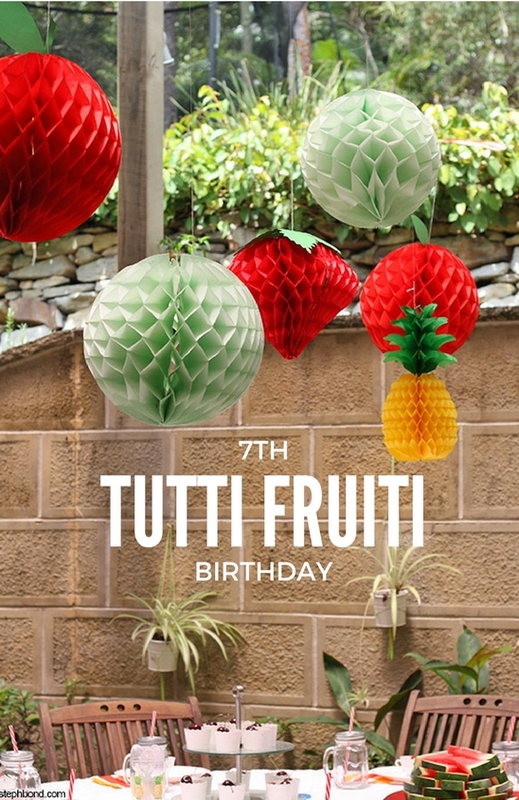 I hope you could find an idea or two to use for your own Tutti Fruiti party. 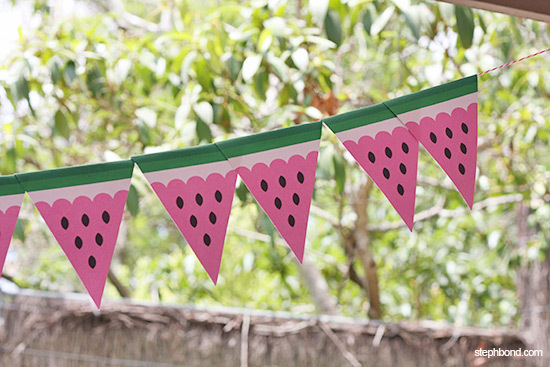 For more Real Australian Kids' Parties, head to the party page here on Bondville. I love that M chose the Tutti Frutti theme! 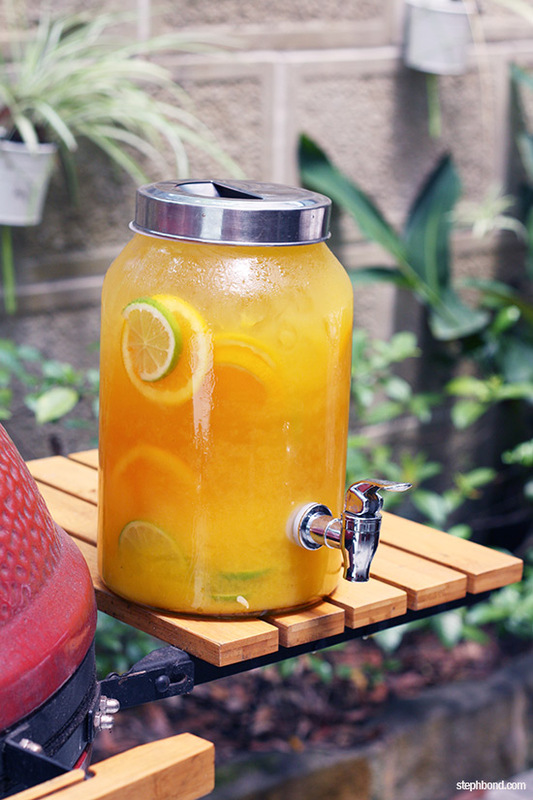 It looks lovely Steph, and perfect for this hot summer. Thanks lovely Lisa! It's so great to have both the girls being involved in the organising and decorating now. I really didn't have much to do with it at all. They are becoming mini party planners!